The Roman Catholic Church in California is to pay $100m (£53m) to the alleged victims of sexual abuse by clergy members, a US judge has announced. The settlement, in Orange County, is the largest made by any Roman Catholic diocese in the United States. It exceeds the payment made by Boston's diocese, where claims of abuse within the Church in America first emerged. Bishop Tod Brown made an apology at a press conference, which was attended by some of the 87 victims. "I seek their forgiveness, I hope for reconciliation and I know they have now begun their healing process," he said. Some of the details of the settlement emerged last month when the Church announced it had reached a deal after two years of talks. The diocese will pay half of the $100m settlement, and eight insurance firms will pay the rest. "Let this be what everyone remembers from today: that nothing is more important than the protection of our children and our youth," said Bishop Brown. He promised changes to personnel policies to ensure "as much as humanly possible, that these things will never happen again". Some of the plaintiffs attending the hearing were tearful. "The acknowledgement of what happened to us makes the difference," said Max Fisher. "We are no longer just alleged victims. It means more to me than anything." The amount exceeds the payment of $85m (£44m) to more than 500 plaintiffs two years ago in Boston. Thousands more cases are still pending in Los Angeles and other parts of the US, with several dioceses reportedly facing possible bankruptcy as a result. 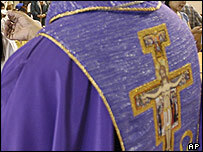 The scandals, which surfaced in Boston in January 2002, have threatened the Roman Catholic Church in the US and beyond. Details of the Orange diocese settlement have not been given, but payouts will be based on the length and severity of the abuse and other factors. The allegations dated from 1936 to 1996 and were made against 31 priests, 10 lay workers, one religious brother and two nuns, the Associated Press reported.